« The Baby Blanket is Done! From cone to warping board, I got the 360 threads measured for my cotton flannel handwoven baby blanket. 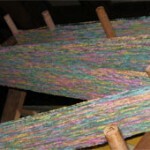 Next steps: tie the warp onto the back beam, thread the heddles, and thread the reed. (With 360 threads, this is a time consuming process, but if you don’t enjoy each step in the weaving process, you’d better find another hobby.) I was almost done and had to take out about 40% of the threads. I’d missed heddles 3 & 4 way back then. Damn! I usually weave with a 12 dent reed. I like it, and it’s pretty versatile. When I wove the first baby blanket from the baby acrylic, I used this reed and it worked fine. But the cotton flannel yarn is very textured and quite “sticky,” so it doesn’t slip by itself easily. 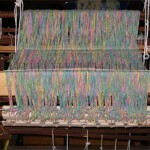 Although I had to make some minor modifications to my loom, I did it so that I could use a 6 dent reed I have. I thought it would be easier to have 3 threads in each dent of a 6 dent reed than to have 2 threads in some of the 12 dent reeds. I’m really glad I did; the 6 dent worked great with the first cotton flannel, so I’m sticking with it for this doubleweave warp, too.